At Brevig Mission School we have little form letters for sending home. There are forms for sleeping in class, missing from class, being respectful, giving your best effort, etc. Teachers drop the completed forms in a box in the office, and the secretary mails them home (it's like magic!). I fill out the negative slips easily, but I only fill out the positive ones once in a while. I'm rethinking that tendency. Kaitlyn has asked me to read the note to her three separate times. Steve and I were happy when we opened the note. Kaitlyn is particularly delighted. It seems that the practice I've always thought of as communicating with parents has a side effect of delighting students. I like to think I acknowledge everything good with smiles, verbal praise, positive attention, and laughter, but there's something about the tangible note that seems more official. 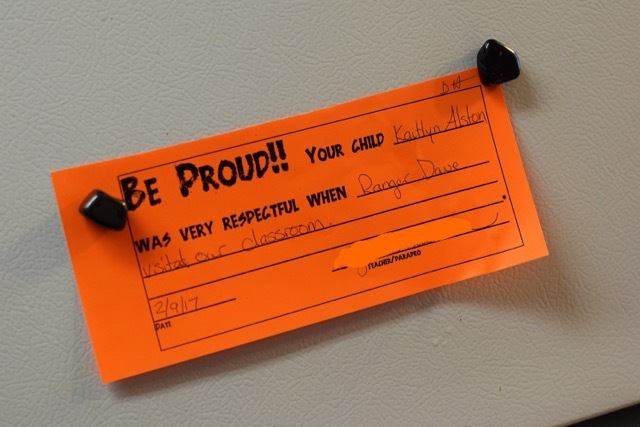 There are some big differences between Kaitlyn's Kindergarten self and the high schoolers I teach, but I suspect my students would enjoy some official praise too. So I'm going to try. I'm going to take the time to think about what individual students are doing well and then let them and their families know. On paper. Officially. I have a standing item in my to do list to send one positive note each week. I don’t always get to it, but I do get through my whole class each year. I’m excited for this! I want to see how it goes!